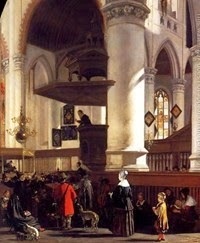 Biography of Dutch Painter Specializing in Church Interiors. (1669) By Emanuel de Witte. The artist's favourite church interior. An active contributor to Dutch Baroque Painting (c.1600-80), Emanuel de Witte is famous for his architectural paintings of church interiors, both real and imaginary. His status as one of the most talented Dutch Realist artists stems from his grasp of linear perspective and his sense of atmosphere, rather than the flawless architecture of his compositions. This distinguishes him from his older contemporary, the hunchbacked Pieter Jansz Saenredam (1597-1665), whose principal focus was the architectural accuracy of his church interiors. His innovative and dramatic use of light also distinguishes him from the sober, occasionally lifeless, style of Dutch Realism - by more conventional Old Masters like Gerard Houckgeest (1600-61) and Hendrick Corneliszoon van Vliet (1611-75) - and gives his particular form of religious art a sense of warmth and security. De Witte's range as a painter embraced several different types of art including history painting and portrait art, while he was also noted for his genre painting, notably his pictures of street markets. Sadly, his life was marred by gambling and debt as well as a prickly character. He finally committed suicide at the age of 76. Like his compatriot Pieter Jansz Saenredam, his portrayal of Protestant and Catholic sanctuaries succeeded in popularizing a new and unique form of Christian art, which continues to exert an aesthetic appeal. To understand how Emanuel de Witte's 17th century Dutch painting fits into the evolution of painting, see: History of Art Timeline (800 BCE - Present). De Witte was born in Alkmaar and studied geometry from his schoolmaster father - a talent that was of great assistance to him in his later mastery of perspective. There are few other recorded references to his early training in drawing or painting. At the age of 21 he joined the Alkmaar Guild of St Luke. After a brief stay in Rotterdam (1639-40), he moved to Delft (1641-50) where he became a pupil of the still-life painter Evert van Aelst (1602-57), who trained him in figure painting and portraiture. De Witte initially specialized in portraits, Protestant art and mythological works. Indeed it was in Delft that he painted his first major work on mythological theme, "Vertumnus and Pomona" (1644, Boijmans Van Beuningen Museum, Rotterdam), which featured a landscape similar to views around Poelenburgh. In 1652 de Witte moved to Amsterdam for a year, finally settling there in 1656, despite the death of his first wife Geerje Arents, the year before. In 1660, due to a scandal involving his young second wife Lysbeth van der Plas and his adolescent daughter, de Witte was obliged to indenture himself to the Amsterdam art dealer Joris de Wijs, surrendering all the rights to his paintings in exchange for a small annual allowance. Although he was an intermittent contributor to Dutch Realist genre painting - with works like the admirable "Interior with Harpsichord" (1667, Boijmans Van Beuningen Museum), which clearly evokes the art of Pieter de Hooch and in which the light, both calm and strong, shines with the poetry of a genre painting by Jan Vermeer, along with his many versions of "Fish Markets in Amsterdam" (National Gallery, London; Pushkin Museum of Fine Arts, Moscow) - Emanuel de Witte was - like Pieter Jansz Saenredam - primarily a painter who specialized in interiors of religious buildings. He painted the old church (Oude Kerk) in Amsterdam, for instance, from almost every corner and angle. 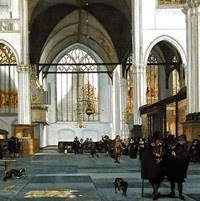 His themes are Gothic churches - both Catholic and Protestant - painted with such imagination that elements are borrowed from several buildings or styles, as in the "Church Interior" in the La Fere museum (also the "Nieuwe Kerk of Amsterdam", 1656, Rijksmuseum; the "Church Interior", 1668, Mauritshuis). He also painted synagogues ("Interior of the Portuguese Synagogue in Amsterdam", 1680, Rijksmuseum) and funeral monuments such as "The Tomb of William the Silent in the Church in Delft" (1656, Lille Museum), a masterpiece of luminosity in which the red patch of the visitor's coat in the foreground stands out against the white of the columns, bathed in subtle light. Much of de Witte's impact as an architectural painter stems from his mastery of 'single point' linear perspective - a painting technique pioneered in Florence by the Renaissance master Filippo Brunelleschi (1377-1446), who employed it in both his architecture and paintings. See also the visually striking interiors by the Dutch Baroque artist Samuel van Hoogstraten (1627-78). De Witte excels in conveying the effect of light coming from outside and evoking an atmosphere of calm and silence undisturbed by discreet allusions to everyday routine, like the presence of dogs, or people talking in churches, conceived, like his interiors, with the subtle play of light on black-and-white tiled floors. The mellow quality of his light is almost unequalled in Dutch church painting, but does not always avoid coldness of detail, or the dryness of perspectives of Saenredam or even more of Houckgeest or Van Vliet. In the Delft school of painting, De Witte must be linked with Carel Fabritius (1622-54) on account of these characteristics, while he deserves to be mentioned alongside Vermeer because of his poetic style, especially in those of his paintings in Moscow or Rotterdam ("Interior with Harpsichord"). Paintings by Emanuel de Witte can be seen in the best art museums in Europe, notably the renowned Rijksmuseum in Amsterdam and the Mauritshuis Art Museum in the Hague.  For more about Dutch Baroque buildings, see: Baroque architecture as well as Baroque architects. The greatest Dutch portraitist and painter of Biblical scenes. Artistic traditions practiced in Flanders and parts of Holland. The style of art approved by Rome and opposed by Dutch Protestants.  For more Dutch architectural painters, see: Homepage.